John Godfrey is a composer and performer, and lectures in music at the National University of Ireland, Cork. His compositions and arrangements have been performed in significant venues and festivals in Ireland, UK, USA, Canada, mainland Europe, and Australia. His work has been widely broadcast on radio and recorded on CD with labels including Decca Argo and Cantaloupe. John was co-founder and Musical Director of the UK-based New Music ensemble Icebreaker, which performed extensively in Europe and America and released several CDs. Since 1997 he has been a member of Ireland’s Crash Ensemble; the group has performed frequently in Ireland, toured in Europe, USA and Australia, made radio broadcasts and has released a CD on Nonesuch. 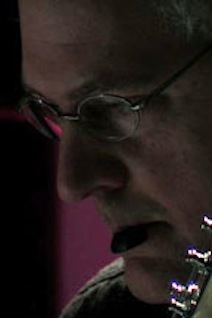 In July 2008, John co-directed the Quiet Music Festival, where his Experimental Music group, Quiet Music Ensemble, first performed: characterised by a unique repertoire and approach to performance, it has since then given several remarkable performances, including a live broadcast on RTE Lyric FM’s Nova. QME will release its first CD in 2012. Godfrey makes frequent appearances as a free improviser, both solo and in ensemble. He has worked with renowned improvisers including Pauline Oliveros and David Toop; in 2010, he performed with the Cork-based soundart/improvisation duo and the sean-nós singer Iarla O’Lionaird for the Irish Pavilion at World Expo in Shanghai.